1. (Sigh) If only the initials on his jacket were I.N.S. 2. "I understand you've been referring to 'KFC' as 'K the C.' I have to cite you." 3. "I'm also going to have to cite the Chihuahua for piddling on my boots." 4. "You've discovered traces of polonium in the green onions? Man, the KGB was really out to get somebody!" 5. E. Coli. was nothing. 63 people were infected with syphillus after Paris Hilton used the Salad Bar. This agent from the Flatulence Diminishment Agency has his work cut out for him. "No no, see, FDA, not INS. They're busy over at the Home Depot." Technically, this stuff isn't considered "food", but an order is an order. "From a Dumpster in the Alley"
Morgan Spurlock was surprised at how quickly he lost weight while filming the sequel to "Super Size Me"...until his doctor informed him the weight loss, like the frothy diarrhea, was the result of food poisoning. 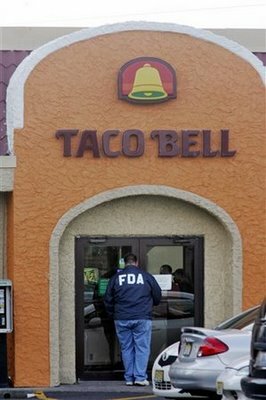 Sadly, the outbreak might have been contained had the FDA agent understood "Pull to Open" before his third visit. "La Migra! La Migra is here!" "I'll have three Santa Fe chalupas, with cinnastix and a side of Immodium." "It's fun to eat with the eeeeeeefffdeeeaaaaaaieeee..."